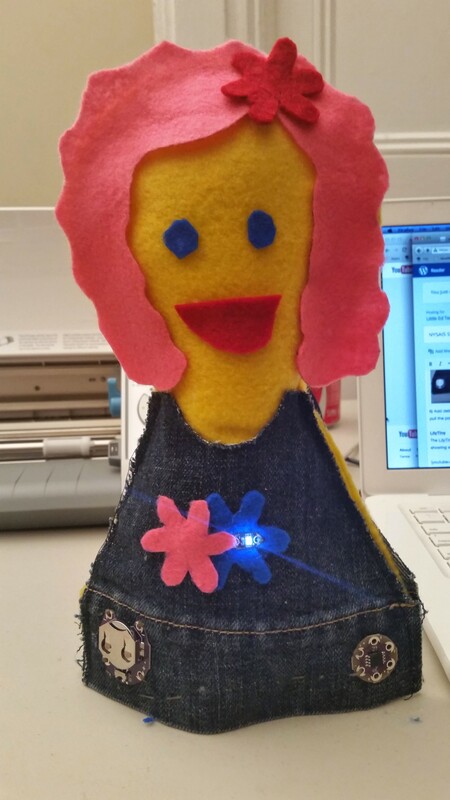 Tomorrow, I will be running an E-Textile activity for 50 current and future STEAM Teachers at the NYSAIS STEAM Camp, August 18-19, 2014. This will be my second year as an organizer and I am excited. As an organizer, I serve as a guide and idea motivator by supplying equipment, suggesting unconference sessions and being a resource to as many people as possible. This year, ​I am bringing a 3D printer, legos, materials for e-textiles and convene sessions on ArduBlock. Below is the exact lesson I and Katelin O’Hare, our art teacher, did with 2nd Grade last spring. I will be running this workshop tomorrow with my colleagues. 1) Make Patterns! I reproduced Katelin’s patterns using a Silhouette Electronic Cutting Machine! The software is free. You can create many designs and print them on different kinds of materials like cardstock, vinyl, fabric, and heat transfer materials. I made a cute little dress! 4) The next part is really up to you. You can have students add details like the hair, mouth, nose, pockets and accents. Or you may choose to have them add the electricity parts now. I am choosing to add the electrical parts first. I am using LilyPad products sold by Sparkfun. I like the LilyPad Coin Cell Battery Holder and the LilyTiny. These items allow you to apply the concepts of electricity at a low entry point with little error and big returns! Add a little glue to your Lilypad Coin Cell Battery Holder. NOTE: Get the one with the On/Off Switch! Also Sparkfun gives a 20% Educator’s Discount. Add a little glue to your Lilypad Coin Cell Battery Holder. Get the one with the On/Off Switch! The Lily Tiny is purely optional if you want to add some effects. This adds a lot more sewing without the programming effect. 5) Now sew your LilyPad Coin Cell Battery Holder to your LEDs. Positives are sewn to positives and negatives are sewn to negatives. Young students can use a regular running stitch. Make sure that students sew tight loops around the circuits. Put the battery in and switch the LilyPad Coin Cell Holder to On! If all goes well, it lights up! Now sew the two pieces of felt together. 6) Add details! And stuff it! You can purchase this polyfill from Amazon or School Specialty. Be sure to have the students pull the poly fill apart because it comes very compacted. Sew the last opening up. The LilyTiny will allow students to add different behaviors to their LEDs. To see what I mean, just click on the short film showing an example of a LilyTiny in action. 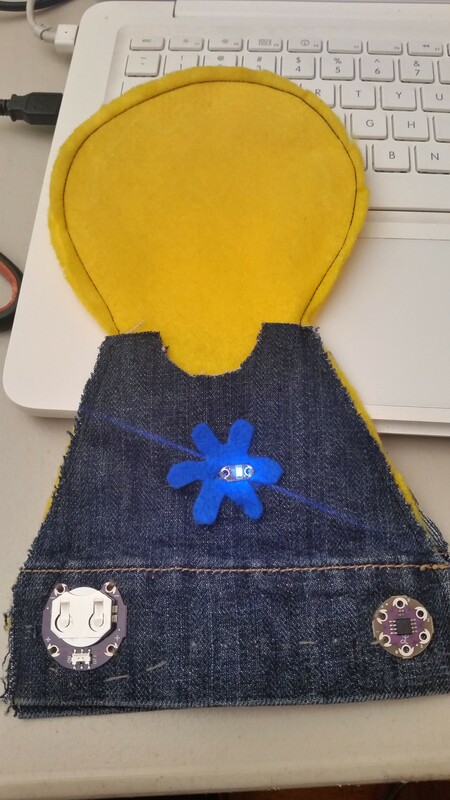 Sew Electric by Leah Buechley, Kanjun Qiu and Sonja De Boer – this book gives you step by step instructions on how to add e-textiles to your curriculum. The lessons are presented in order of difficulty. This is the first place to begin if you want to begin e-textiles. I found the best prices on felt at Michaels Arts & Craft. Finally, the students planned their designs and drew out how they would sew their circuits using this worksheet. I asked them to use black ink for the negative path and red ink for the positive path. ← No FabLab, No Problem! Guest Blogger Benedick Raikes Sends a High Altitude Balloon (HAB) into Outer Space!